I was going to finish the week off with leftover Thanksgiving turkey sandwiches, but after Thanksgiving dinner, then turkey pot pie, then curried turkey salad wraps, I'm done with turkey. Since I'm the ONLY person in the blogosphere who bought a 23.5 pound turkey for four people, I think it's safe to assume that I am the ONLY person who still has leftover turkey. So the rest is going in the freezer, and I'm moving on to Christmas cookies. If you're looking for a unique Christmas cookie this year, try Monica Bhide's Saffron and Cardamom Macaroons. They're easy to make and are remarkably fragrant and sweet. Though I have baked with cardamom before, I have never baked with saffron. Like most people, I've always relegated saffron to savory dishes, but Monica has convinced me that saffron has a sweet side. 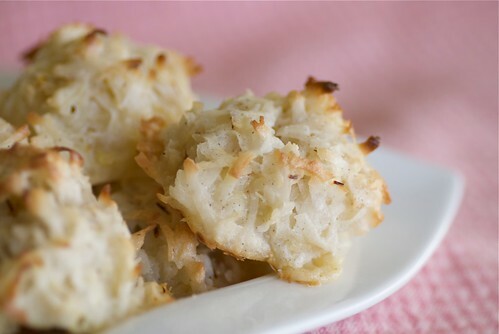 Because of its floral overtones, it works well in these sweet and spicy cookies. This recipe is from Monica Bhide's cookbook, Modern Spice. 1. Heat the oven to 350 degrees F. Prepare a baking sheet by lining it with parchment paper and lightly spraying with nonstick spray. 3. To whip egg whites, start with room temperature eggs. I like to add a touch of lemon juice, salt, or cream of tartar to help the eggs get to the peaks. Once you begin to whisk them and they reach the soft peak stage, stop. If you continue to beat them, the proteins will break down and you will have a soft mess on your hands. Gently fold in the whipped egg whites to the mixture. 4. Using a spoon, mold the mixture into tablespoon-size balls and place 1 inch apart on prepared pan. 5. Bake for 14-16 minutes, until exterior is very slightly brown, the middle is still soft, and the bottoms are beginning to turn golden brown. 6. Remove from the oven. Allow to cool for about 20 minutes on a wire rack. 7. Serve at room temperature. These can be stored in an air-tight container for up to one week. For more about Monica Bhide's latest cookbook, Modern Spice, check out my review. You can also listen to an interview entitled "Our Insatiable Appetite for Cookbooks"with Monica and Adam Gopnik of The New Yorker. Nice flavor combo! They must taste heavenly! 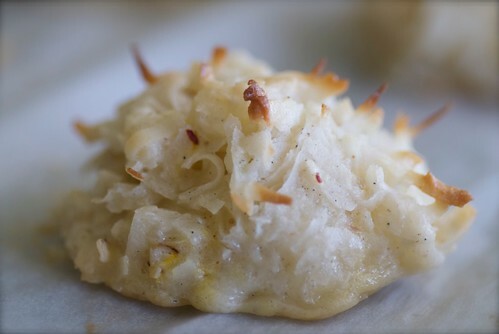 These look wonderful - I love coconut with the cardamom and saffron. Thanks!! I am so excited you tried it and liked it! I love these little cookies. Saffron and cardamom? That really is exotic to me. I'd love to try them. I love coconut! Have to try this flavor combination. Sounds interesting!!! I am with you about the turkey! Cooked 3 different turkeys before I could post it on my blog. We had 40 pounds of turkey! I love cardamom - I bet these are a really different flavor! They're so darn pretty! I love baking with cardamom. Oh my! These look so delicious. I love both cardamom and saffron and am already trying to figure out how to make these sugar free. Beautiful photos, Susan. I think you should give a class on how to take perfect food photos. love the saffron, cardamom and coconut combination. delicious. I love saffron and cardamom in sweets. Always makes for a special treat. Love saffron in sweet things. And so tantalizingly fluffy! I'm a big fan of Monica and these sound so good! I'm also kind of obsessed with cardamom at present so I can't wait to try these. Happy to know about the Xmas cookie event you are hosting...will be sure to make something to be part of that! Great cookies. They look like snow. What a cool idea! One of my favorite restaurants has this INCREDIBLE dessert that is poached pears in a saffron broth. Saffron+ sweet+ awesome! Yeesh, we had a 10-pound ham for 8 people and we didn't even finish that!! I hope the leftovers are all gone now (and wasn't thrown out)! anonymous-I really hope you do! teachercooks-40! Whoa! I mean, Whoa! annelise-Yay! I'm sure Monica will be thrilled. christine-That is so kind of you to say. Thank you. mini-Perfect for the winter season! lele-Oh, you must go there a lot! mark-Nope. It's in the freezer. Took me a while to realise that macaron and macaroons were different....it was a long while i was confused, i tell ya. Glad to be shot of that, these look good! I came back to catch up on the round up and get the bacon chocolate chip recipe, and found this other lovely nibble too! You must have the best cookie jar!